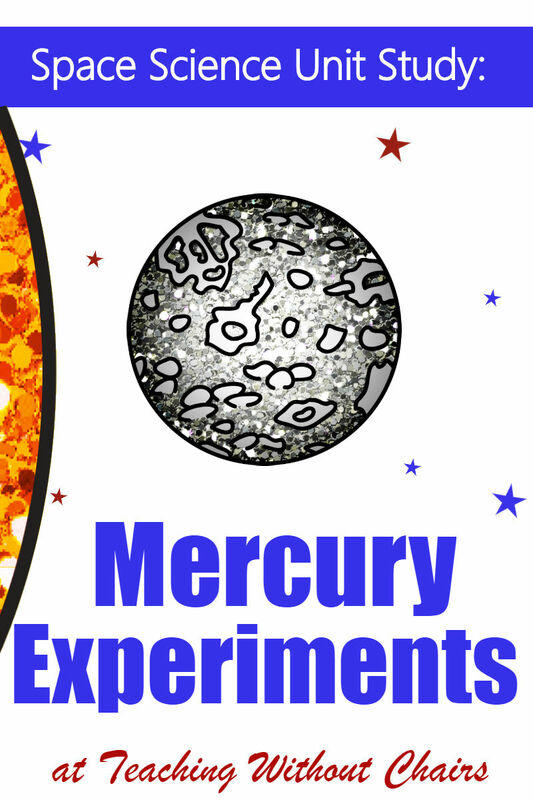 I designed these science experiments to help teach our kids about the planet Mercury as part of our homeschool Space Unit Study! If you're learning about space or the solar system, you will love these science activities! * It only takes 88 Earth-days for Mercury to travel around the sun! * For every 2 orbits around the sun, Mercury completes 3 rotations around itself! * Mercury does not have any moons or rings. * Temperatures on Mercury can vary from -279 F to 800+ F! This is because there is basically no atmosphere helping to regulate the temperatures. Whatever parts of Mercury facing the sun get extremely hot while the parts facing away from the sun get extremely cold. * Mercury is small enough that it does not have a significant atmosphere. The first Mercury science experiment relates to this. 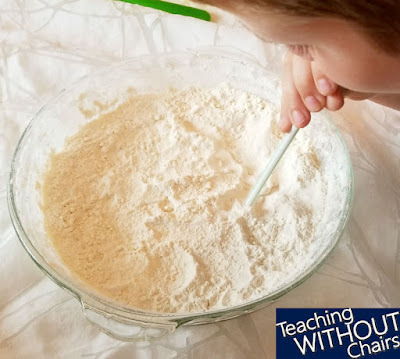 To prepare for both experiments at the same time, grab a pie pan and add just enough water to cover the surface of the pan. Then add about an inch or two of flour. 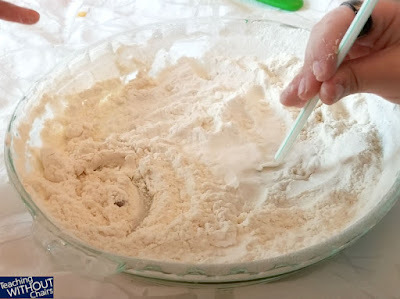 The water helps hold on to the flour, like Mercury "holds" onto its surface rocks. Now, on to our experiments! You will want to grab some chocolate chips and straws, and set them out with your "Mercury." Most meteors that approach the Earth are either bounced away from Earth by our atmosphere or burned up as they enter the outer layers of the atmosphere. Since Mercury does not have a strong atmosphere, it gets hit by more meteorites than Earth, and those leave many impact craters on Mercury. 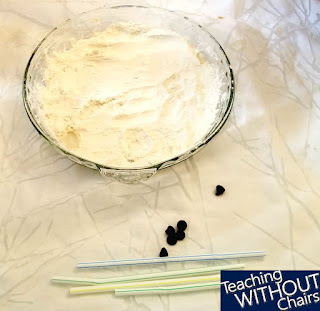 For a fun and easy crater-making meteorite-raising experiment that your older kids can do with your preschoolers, click here! (Hint: you just need some flour and chocolate chips!) Then jump back over here for one more fun little experiment you can do to learn more about Mercury's surface! 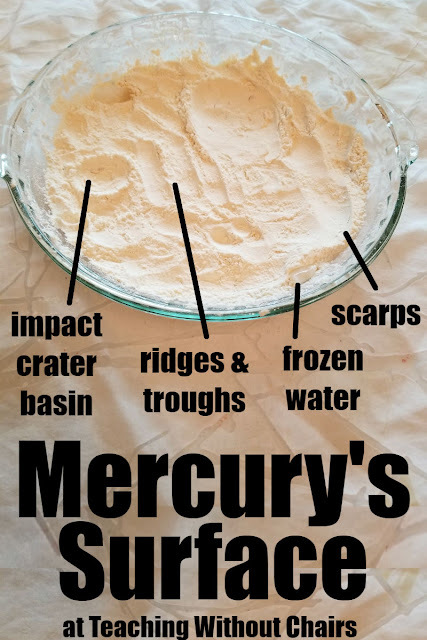 Impact craters and basins are made from meteorites hitting Mercury's surface. Ridges and troughs were most likely formed from ancient lava flows. There are also several images that look like extinct volcanoes on Mercury's surface! The frozen water represents the ice at the poles. Most recent data suggests that there are permanently frozen water "caps" on Mercury's chilly poles. Scarps seem to be "seams" on Mercury that formed as the planet cooled. When the inner parts of the planet cooled, they shrank. The hard crust then needed to shrink to, but as it did so, it left behind "scarps." The second experiment is also related to Mercury's almost-non-existent atmosphere. Solar winds from the sun bombard the surface of Mercury all the time! Sometimes they are so intense, that they kick up minerals from Mercury's crust into a dusty little atmosphere. BUT, Mercury doesn't have enough gravity to hold onto all that dust, so it poofs up around the planet, and then falls behind it as Mercury races around the sun. When this happens, Mercury looks like a little comet! 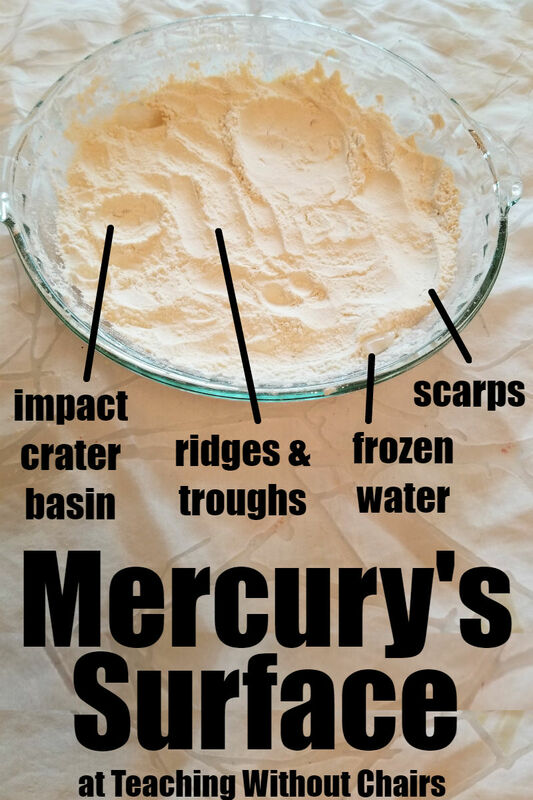 Finally, let your kids experiment with their "Mercury" and their other supplies however they want! 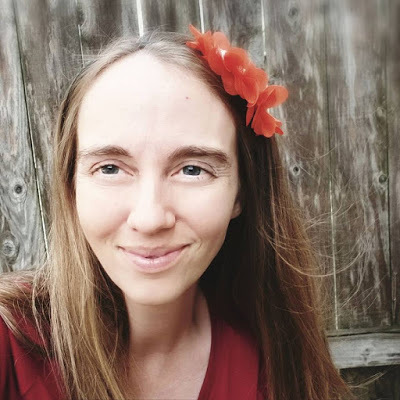 You don't want to dictate everything they should try, and they probably have a lot of great ideas of their own! 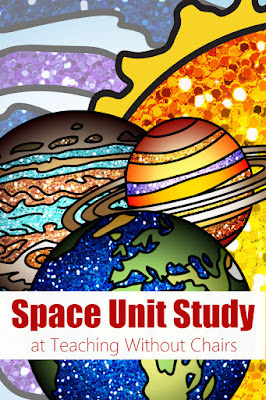 Are you looking for a space or solar system themed homeschool science curriculum? 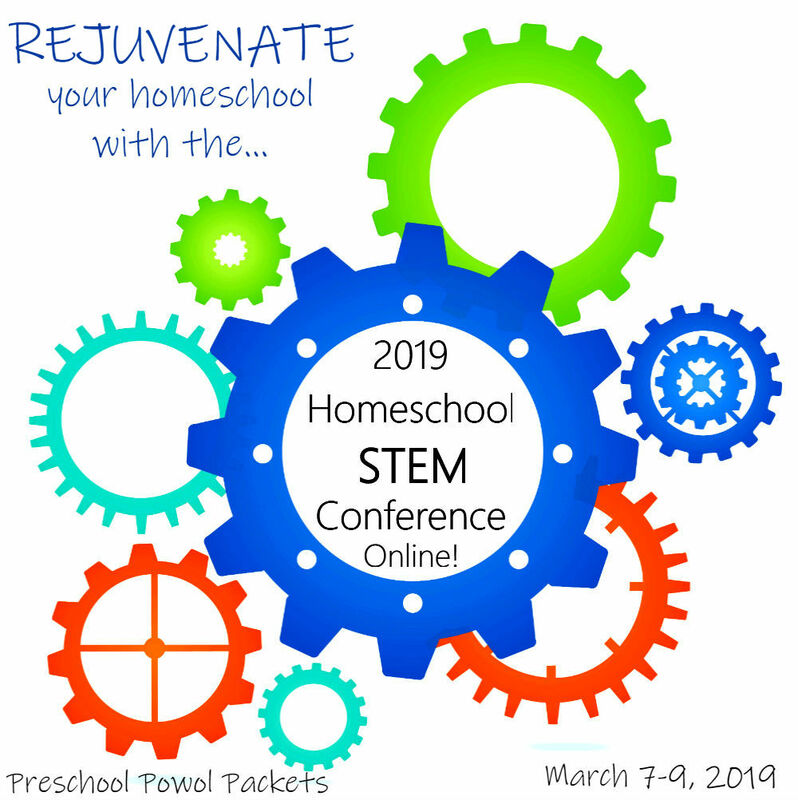 I'm putting together one for elementary aged students right now! 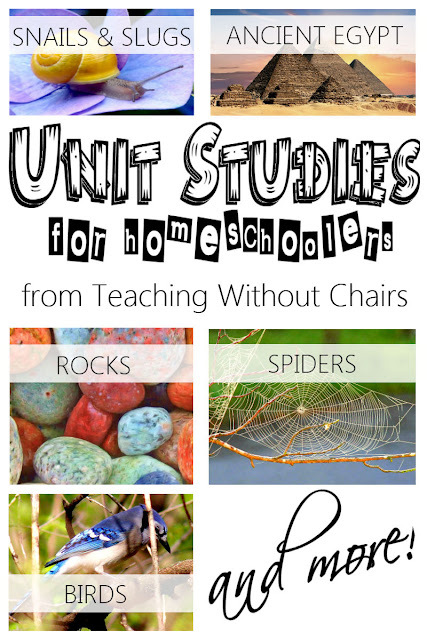 You can get the experiments and other activities as I publish them by visiting the Homeschool Space Unit Study page here!